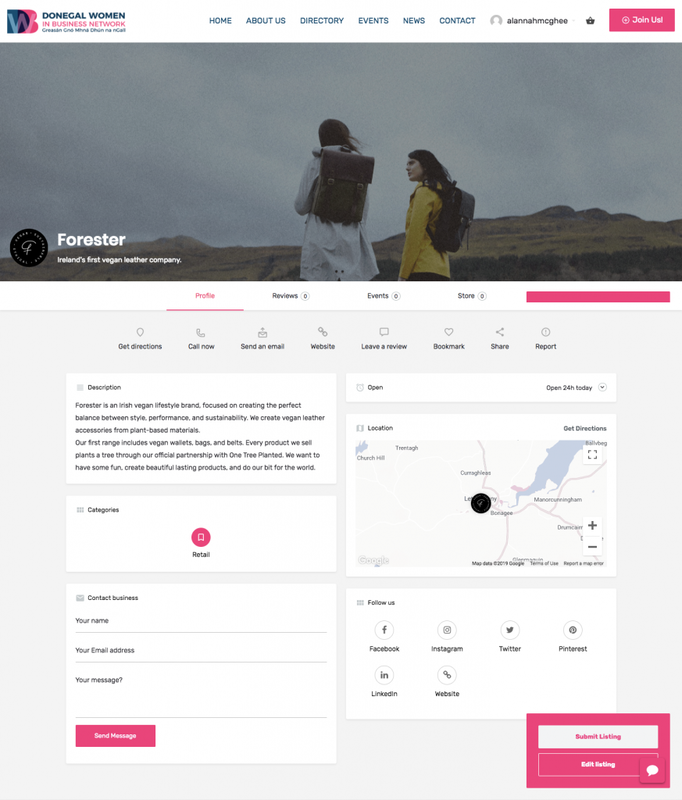 We want to make joining as easy as possible for all members and members-to-be! 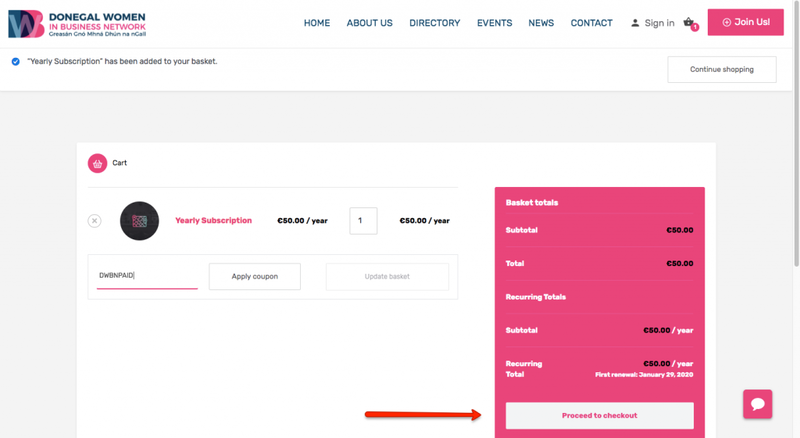 By following the below steps or downloading the Joining Guide you will be able to become a member and upload or update your business listing in just a few quick steps. 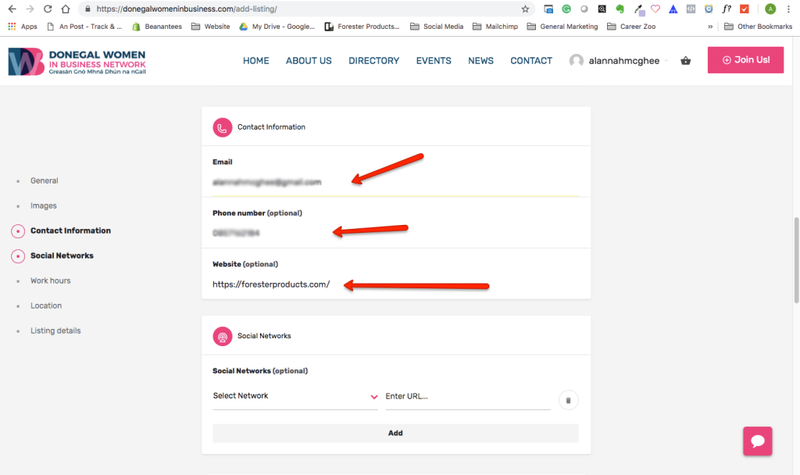 If you are an existing member of the Network, click here and follow the instructions to add or update your business listing. Click the big pink ‘Buy Now’ button. 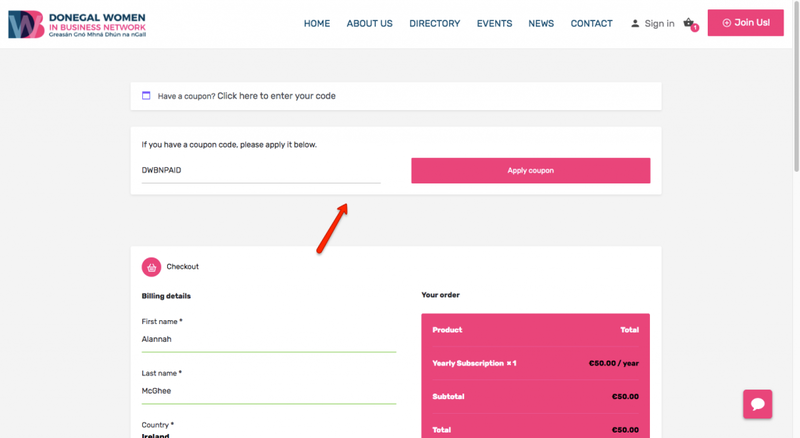 If you have a discount code, enter it in the ‘Coupon Code’ and then click the ‘Apply Coupon’ button. 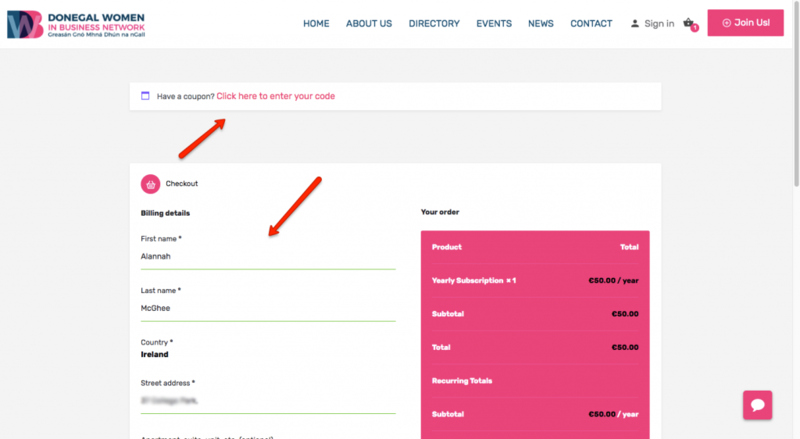 Click ‘Proceed To Checkout’ on the bottom right corner. Fill in your billing details. If you have forgotten to enter your discount code you can hit ‘Click here to enter your code’. Enter your code and click the ‘Apply Coupon’ button. Enter your card details and hit ‘Sign Up Now’. NB. You will be required to enter your card details even if you have a discount code, as they will be used for auto-renewal of your membership the following year. You can cancel your membership at any point. 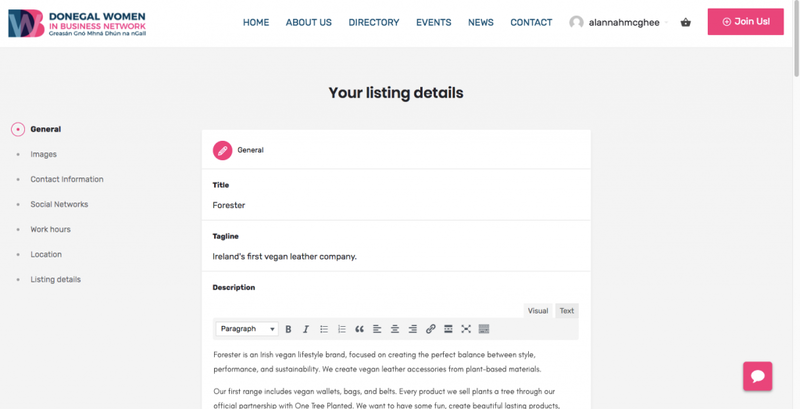 Now it’s time to set up your business listing. Click ‘Add Your Business’. There are seven parts to the Business Listing section. It is important to add as much detail as possible to really showcase your business. 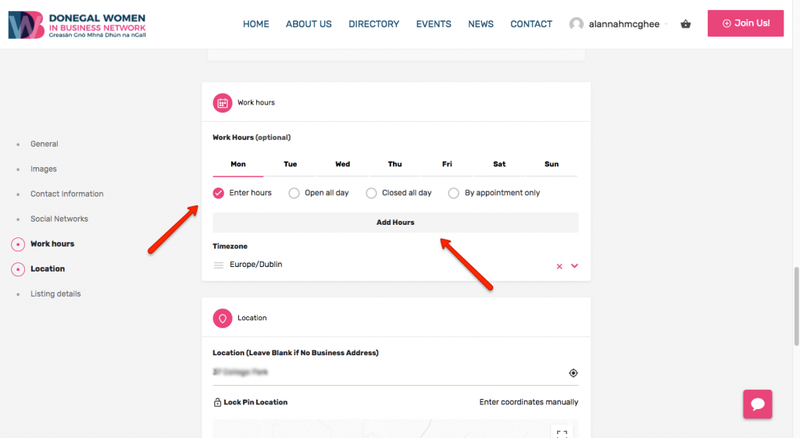 Enter as much detail as possible about your business in each section. Write a nice, detailed description of your business, products, and services. 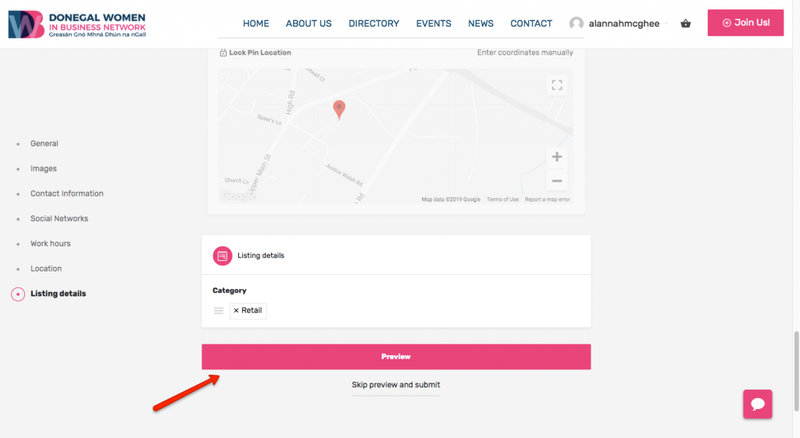 Be sure to add a clickable link to your listing in the general section. To do this highlight your company name, click the ‘link’ button and enter the full URL, including the ‘http’ or ‘https’ at the beginning. 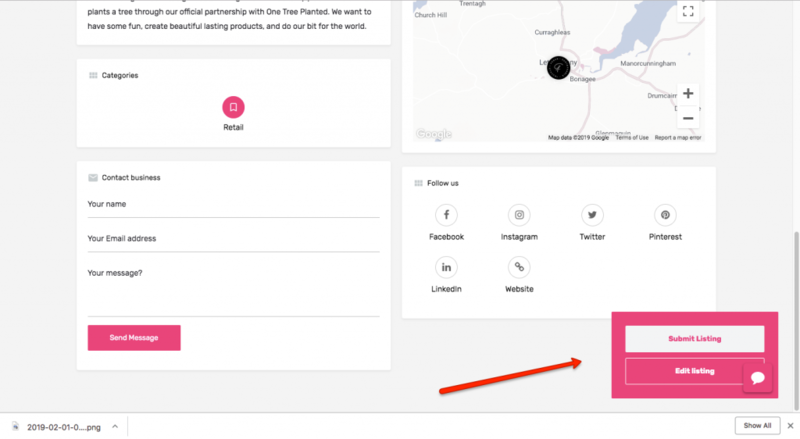 This will let people visit your business directly from your Business Listing. 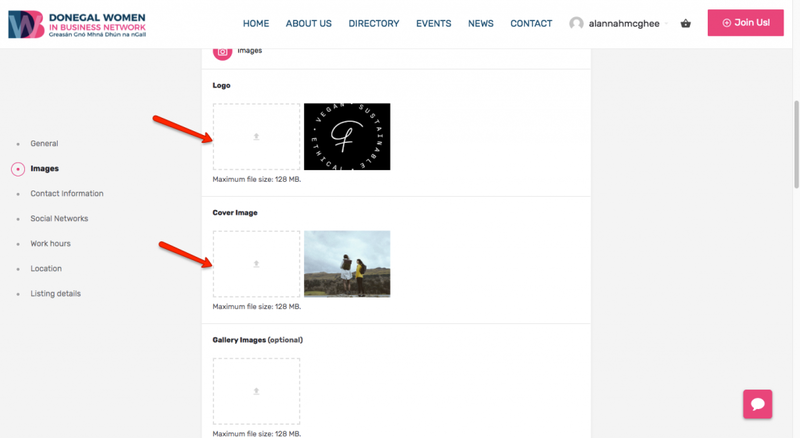 Add a logo, cover image and any other images you would like to show off in this section. Click on the box with the little upwards facing arrow to open up the images on your computer. Use a square image for the logo as the photos will be cropped into a circle on the website listing.The cover page is a long image (dimensions – 1425 X 500) so be sure to use a long image for this, possibly something like your Facebook/Twitter/LinkedIn cover photo. 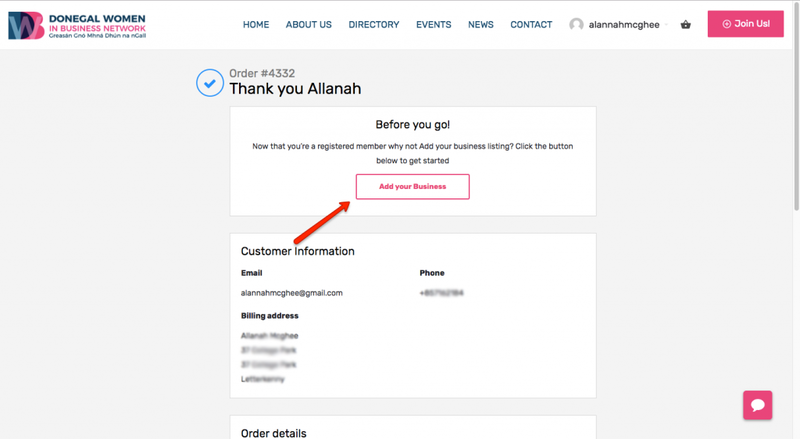 Add relevant business contact information. Add as many networks as you have. The main ones will be Facebook, Twitter, Instagram, YouTube etc. Click the ‘Select Network’ button to choose as many as you like. 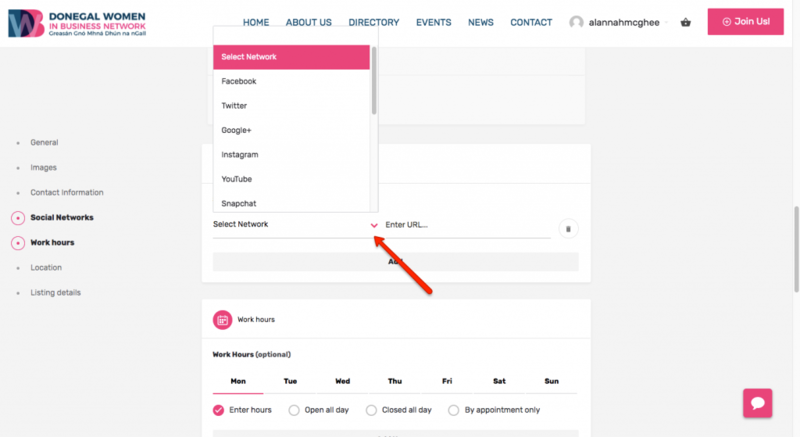 Once you choose your network(s) you now need to add the full URLs. 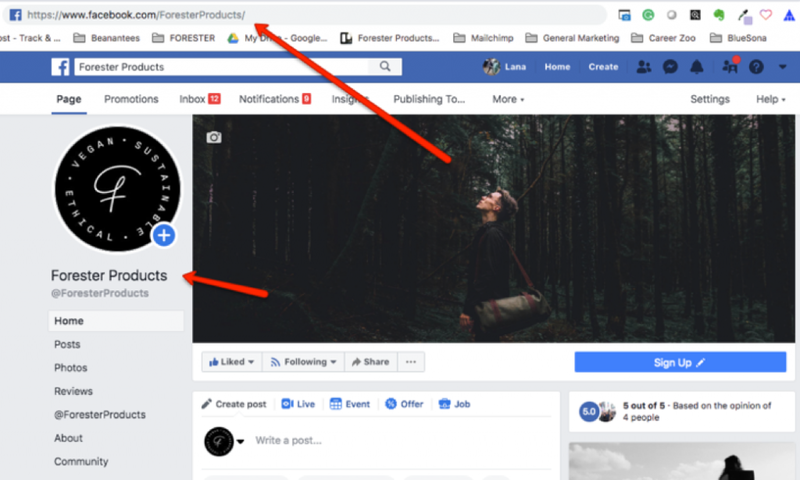 To get these go to your business’ social media page (Facebook for example), you can copy and paste the URL from your browser. 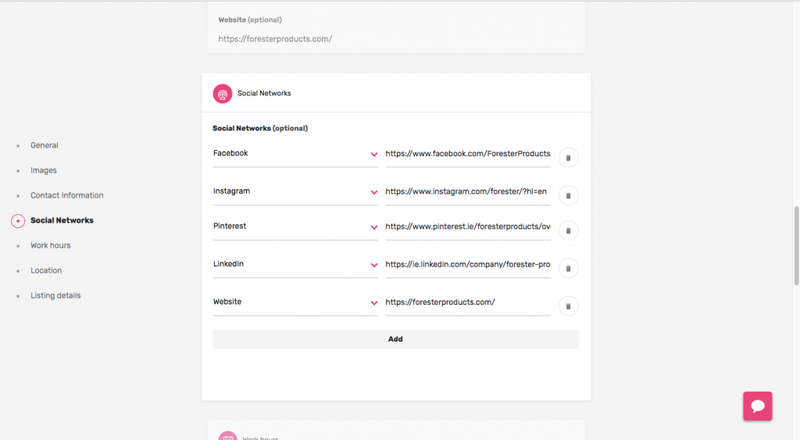 Add the URLs for all selected social media pages, and your website. 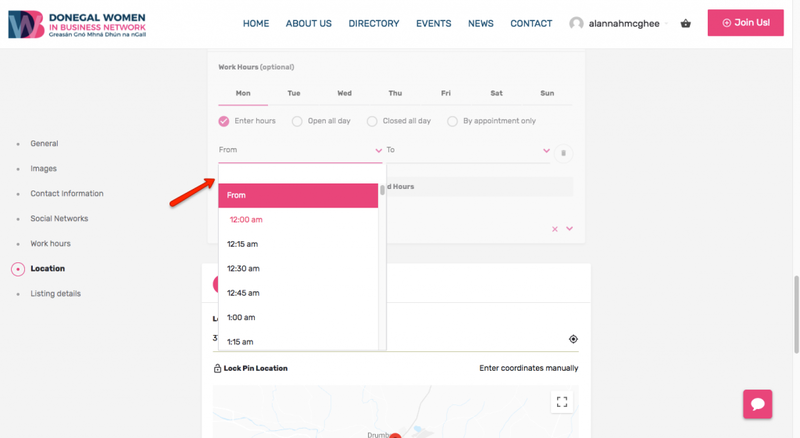 Depending on when your business is open, use the day tabs and ‘Add Hours’ button to update the correct times. Do this for every day you are open. 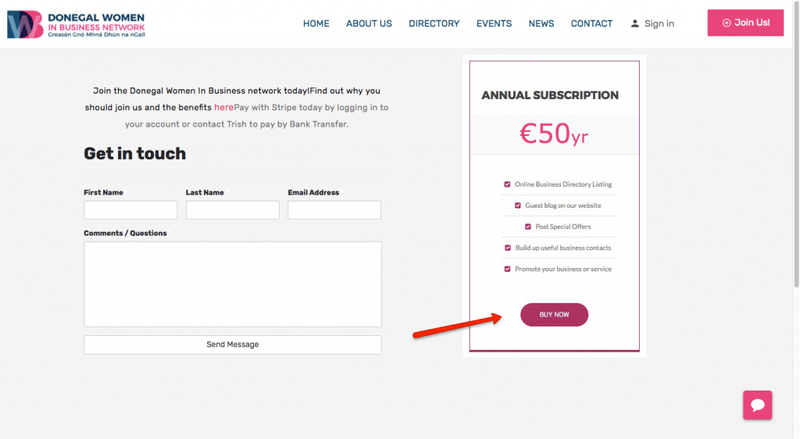 If you are an online business you may want to choose ‘Open All Day‘. Enter the full address of your business. 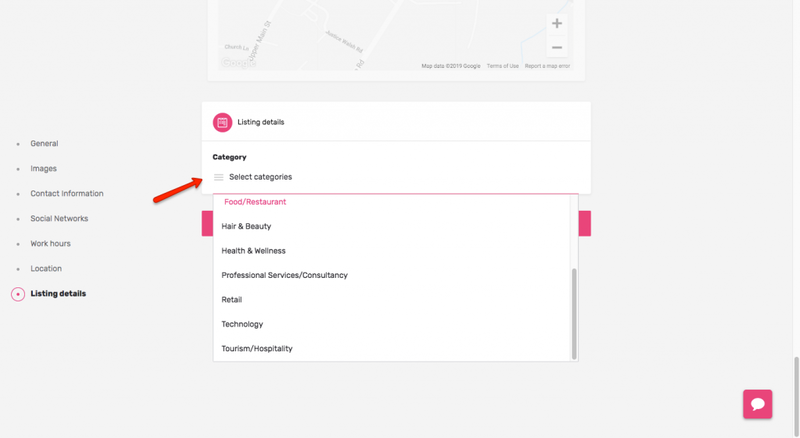 Choose the category which best describes your business from the drop down menu. 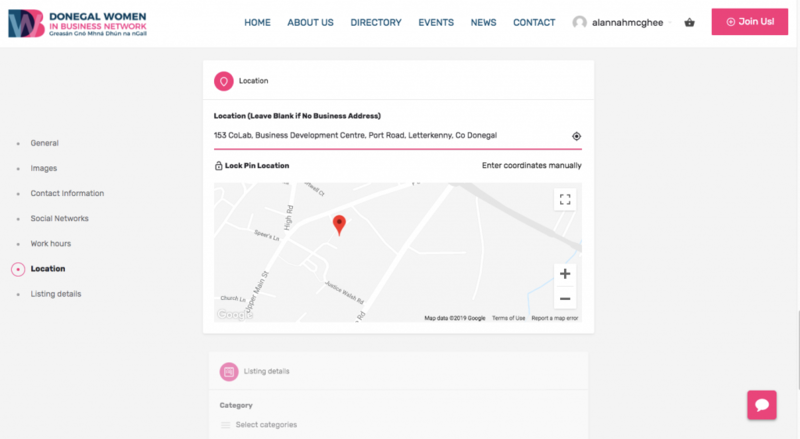 You will be shown your completed business listing. You should ensure you are happy with how your photos look, check the text for typos and make sure all your links are working correctly. Once you are happy with your listing, click ‘Submit Listing’. 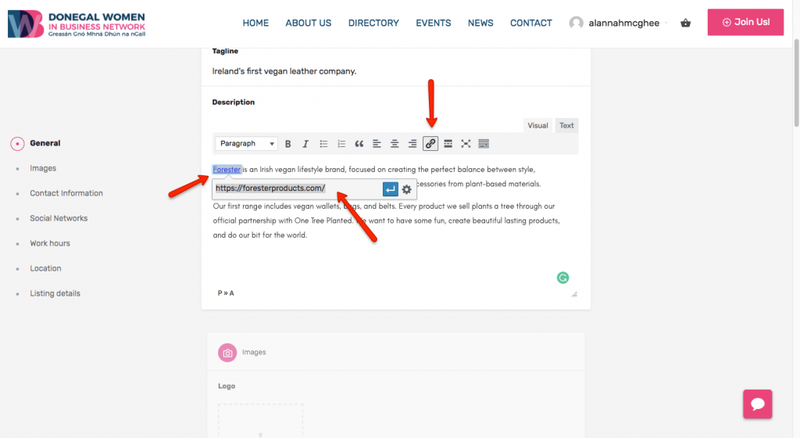 Or click ‘Edit Listing’ to make any changes. You will see the below message confirming your listing submission was successful. You will receive an email confirmation of the same. It will take a couple of days for your profile to be approved. 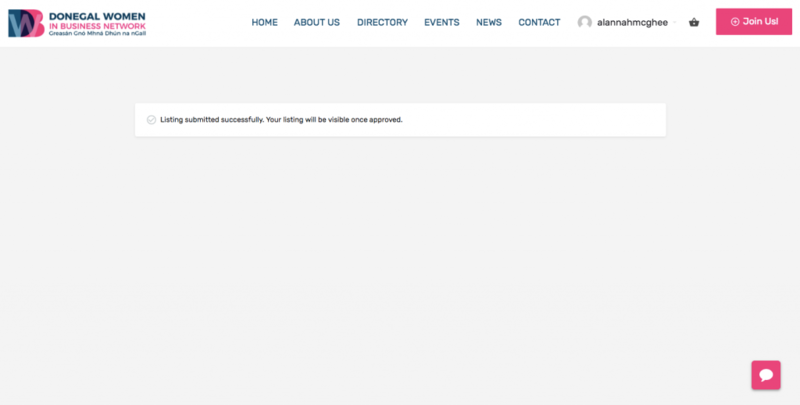 Once it is, you will see it listed in the Directory section of the website. 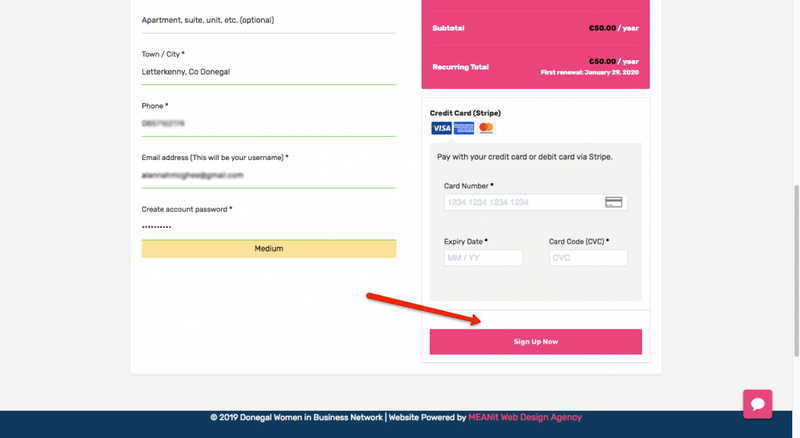 If you’re having difficulties setting up your account, please email us at donegalwomeninbusinessnetwork@gmail.com and we’ll get back to you as soon as possible with further instructions.